For 19 sold out years, Huron Tours has been bringing groups of dog loving travelers to New York City for the Westminster Dog Show. We've perfected the experience. Please read on for more information on this fantastic excursion, and use the buttons below to request a free printed brochure, or learn all the details about this tour online. See you soon! Lunch at one of New York's greatest Italian restaurants, Carmine's! Optional Meet and Compete - Agility Add-On (click here for more info). 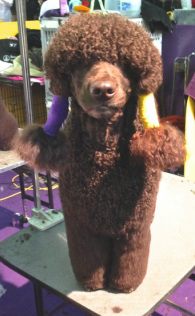 Westminster Dog Show is Full of Friendly Faces! © 2011 - 2019 Huron Tours & Travel. All Rights Reserved.